Sports injuries aren’t just something that you see pop up on SportsCenter that ruin your fantasy team; many people play sports recreationally on their weekends. Trained athletes and regular Joes and Jills alike can all get hurt playing sports. What are the most common injuries we see? Let’s take a look at some ways to prevent these common injuries, and when you should see a doctor. If you are suffering from any of these injuries and need medical assistance, give us a call at Chicagoland Complete Healthcare. 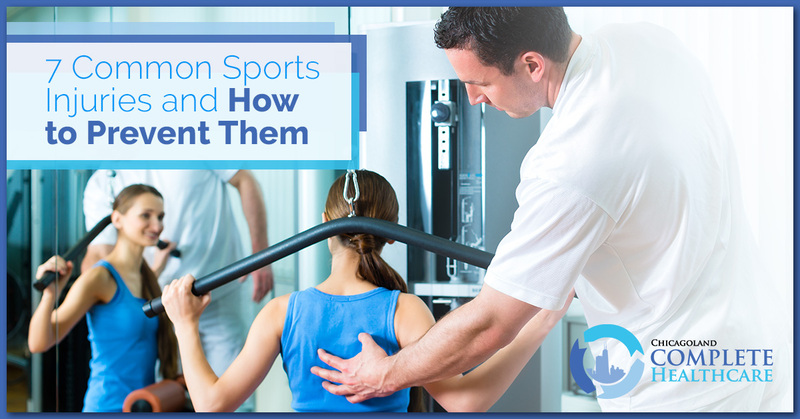 Our physicians are trained in sports medicine and will help you get back on the field. -What are strains and sprains? Before we get into the specifics of each injury, it’s important to understand how your muscles and tendons work and how they can get damaged. A sprain is an injury of a ligament, which is a tough band that connects bones together in a joint. If a ligament is stretched past its limits suddenly, it will tear or otherwise deform. A strain is an injury to the muscle fibers or tendons that connect muscles to bones. They are often referred to as a ‘pulled muscle’, as they are caused by overstretching or overusing a muscle, causing the muscle fibers or tendons to tear. Ligaments and tendons are very similar to a spring. They extend when stress is applied to them, and then return to their normal size. An injury happens when they are stretched past their limits. It’s not always possible to prevent an injury, but many times, they come about because you’re not conditioned for that activity. A professional athlete can bounce back from injuries like these easier because his or her body is trained for it. By that same token, if you don’t work out regularly, your body will not be conditioned for exerting itself at a high level. Many times, warmups are skipped or aren’t done properly. A good warmup will increase the blood flow to your muscles, allowing them to be more flexible, reducing the possibility of strain. Before you start an activity, do some warmups focused on the muscle groups that you’re going to be using the most. If possible, add these warmups to a workout in the weeks prior to this activity. That will ensure the muscles are prepared for the exertion you will be putting them through. Training your body like this will help prevent many injuries, or at the very least, lessen the severity and make recovery easier. It’s also imperative you understand your limits. When fatigue sets in, it’s time to stop. When your muscles are fatigued, they aren’t able to stay protected and it will increase your risk of injury. It’s not like it’s Game 7 in the World Series; you can just play again next weekend. Don’t risk permanent damage by pushing yourself too hard. Even if you don’t consider yourself an athlete, you’ve probably experienced an ankle sprain at some point in your life, even it was minor. It occurs when your foot turns too far inward, which stretches or tears the ligaments on the outside of your ankle. This is common because those ligaments are pretty weak. The best method to prevent this is to exercise to increase the flexibility and strength of the muscles and ligaments. Walking calf raises can strengthen your calf muscles, which connect to your ankle and improve its balance. There are also stretches you can do to improve the mobility and strength of your ankles and their ligaments. If the sprain causes tenderness above the ankle, this is a ‘high ankle sprain’ and should be seen by a doctor to ensure the bones in your lower leg have not separated. When engaged in a sport with a lot of side-to-side motion and sudden changes of direction like hockey, soccer, football, or baseball, strain can occur in the muscles of the inner thigh, otherwise known as the groin. Many times, you can treat this on your own with some compression, ice, and most importantly, rest. If you do not allow the groin enough time to recover, it can get re-injured easily and lead to long-term issues. You can help prevent groin pulls with stretches like side lunges and sumo squats. If there is a significant amount of swelling caused by a groin pull, it’s time to have a physician take a look. The hamstring is made up of the three muscles in the back of your thigh. It can get overstretched by activities like hurdling, where you kick your leg out sharply while running. A surprising but common cause is falling forward when water skiing, as it puts an intense amount of pressure on the muscle very suddenly. An injured hamstring can take anywhere from six to 12 months to fully heal because it is put under constant strain just through daily walking. It’s common to see hamstrings get re-injured because of how difficult it is to properly rest them. If you’re experiencing pain shooting down the front of your shins, you’re feeling what is commonly referred to as shin splints. Typically, they are brought on by long stretches of running. This is especially the case when running for long periods on pavement, like a marathon. The main ways to treat shin splints are the old standbys — resting, icing, and standard over-the-counter pain medication. If the pain doesn’t go away after a good amount of rest, you may have a stress fracture in the shin bone. At that point, we recommend seeing a physician. A stress fracture will have a longer recovery time, typically healing after about a month or so of rest. The ACL (anterior cruciate ligament) is the ligament connecting the femur to the patella (kneecap). Sudden changes of direction, stops, or a hit to the side of the leg can all tear or strain the ACL. If it is completely torn, it will be accompanied by a pretty gruesome popping sound. An ACL tear is not something that will heal with a little bit of ice. If you ever think you have an ACL injury, it’s imperative you visit a doctor immediately. A torn ACL is easily the most severe common sports injury, and if not treated properly, it can leave you permanently hobbled. If the ACL is completely torn, surgery will be required to restore its connection between leg bone and kneecap. This is a fancy term to describe damage to the cartilage and tissue under your kneecap from rubbing against your femur. It can be brought on through vigorous running, volleyball, and basketball, both of which require a lot of jumping. To treat this, continue with a low-impact exercise regimen. Many have reported that working out the quadriceps of the injured leg can help reduce pain. Caused by repetitive use of the elbow, like during a golf or tennis swing, which irritates or makes small tears in the tendons of the elbow. Commonly seen in 30- to 60-year-olds, epicondylitis can usually be healed with rest until the pain goes away. While many of these injuries can be treated at home with some TLC and over-the-counter medicine, it’s incredibly important you don’t try to ‘tough it out’ if the severity of the pain does not go away after rest and ice. If you ever believe you have a serious injury, contact a doctor right away. A serious injury can be identified if your bone or joint looks crooked or moves in a way it shouldn’t, if you cannot put any weight or use the injured limb without it giving out, or if there is excessive swelling or discoloration beyond normal mild bruising. If you’re experiencing any of these symptoms, call us at Chicagoland Complete Healthcare. Our physicians are experts in sports medicine and can help get you back to 100 percent.